Product prices and availability are accurate as of 2019-04-12 09:10:50 EDT and are subject to change. Any price and availability information displayed on http://www.amazon.com/ at the time of purchase will apply to the purchase of this product. 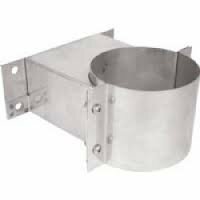 Z-Flex Z-Vent 4" Wall Support Stainless Steel Venting (2SVSWS04). The Wall Support provides support to the vent system while maintaining proper clearance to combustible materials. Vertical supports are required after any 10 foot run. These vent supports may also be used to support long horizontal runs, which require support every 6 feet. Z-Flex Z-Vent stainless steel vent pipe is ideal for the Bosch Therm 940ES / Bosch Therm 830ES / Bosch Therm 660EF / Bosch AquaStar 2700ES / Bosch AquaStar 2400ES / Bosch Evolution 500 tankless water heaters as well as the legacy Bosch Pro 715ES / Bosch Pro 635ES / Bosch AquaStar 2400E / Bosch AquaStar 250SX heaters as well as the Bosch AquaStar 240FX, AquaStar 125FX, Takagi TK1, TK2, TKD20, TKJR, TK1S, TM1 tankless water heaters. Z-Flex Z-Vent is rated AL29-4C and is approved for Category I (vertical only), II, III & IV applications and is designed for use with boilers, high efficiency gas and oil heaters and water heaters where cool flue gases are vented under pressure. Z-Vent contains a built-in, fail-safe gasket and locking band connection. No sealant is required.